The “Water for All” Campaign is an initiative by the Diocese of Polynesia to improve the provision and storage of water and water related services available for Communities, Schools and Parishes across the Diocese. The campaign is building on the work undertaken as a result of an original AAW appeal that raised over $20,000. AAW still continue to support this project today. 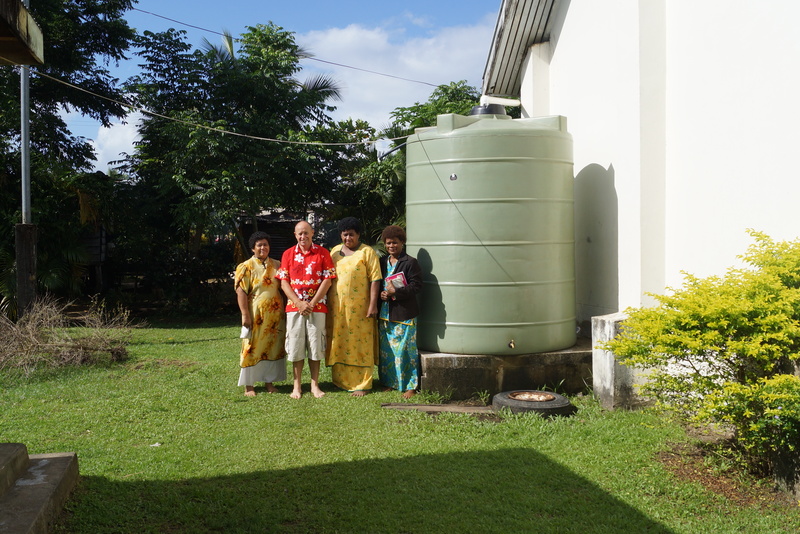 The ladies at Waidradra proudly display the water tank that supplies fresh, clean water to their village. The luxury tourist industry has put the Government water supply (where it exists) under severe strain with the result that a number of villages have a very uncertain water supply. Illnesses borne from unhealthy water supplies have been prevalent for a number of years for these communities who have to find alternative water supplies from unhealthy sources when their water supply is under this strain from tourism. As a hub for the community the church is working to provide a back-up when necessary. The impacts of climate change has also seen a number of low-lying bore water supplies compromised by salt and the church is commencing work on this issue as well. Over 20 locations are currently being assessed and it is estimated that around $2,000-$5,000 will fund a water tank project at each site.